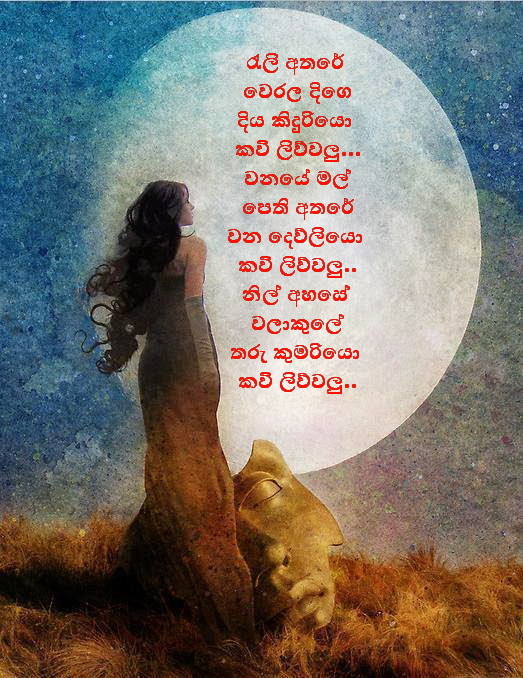 අම්මේ ඔබේ ආදරේ මට වචන උනා..
Last edited by Sara531; 12-06-2018 at 08:03 PM. නැවත එලකිරි කාව්‍ය හා නිසදැස් අංශය නගා සිටුවිමේ අරමුනින් ඇරඹි මේ නුලෙහි ඔබේ සිතට නැගෙන කාව්‍යමය අදහස් පලකරන මෙන් ඉල්ලා සිටන අතර ඇසැබි වදනින් යුතු කාව්‍ය නිර්මාණ පල කිරිමෙන් වලකින ලෙසද කාරුණිකව ඉල්ලා සිටිමු..
ඕනෑම බාශාවකින් ඔබගෙ කාව්‍ය නිර්මාණ මෙහි පල කල හැකි අතර අන් අය ලබා දෙන ප්‍රතිචාර සම සිතින් දාරාගන්නා ලෙසද ඉල්ලා සිටිමු..
Last edited by donkosala; 12-06-2018 at 06:18 PM. Last edited by EK KILLER; 12-06-2018 at 05:04 PM. Last edited by hichchiputha; 12-06-2018 at 07:53 PM. Last edited by hichchiputha; 12-06-2018 at 07:54 PM. Last edited by hichchiputha; 12-06-2018 at 07:58 PM.